I have to confess that I am not particularly fond of Portuguese pastries and bread. Perhaps it is because of my Polish roots. I used to eat dark wholegrain bread and here in the Iberian Peninsula, we have mainly the white. I love elaborate cakes with fruits, layered with whipped cream or full of spices. Portuguese bakers do not need much more to make a cake than one thousand eggs, a tonne of sugar and maybe some flour. ;) Pastries and cakes are always wildly yellow and often covered with some ovos moles (a kind of paste made with yolks and sugar, of course). Here, in Lusitania (as they sometimes call Portugal), the food is usually rather simple, which definitely does not mean tasteless. The local cuisine puts more stress on the extraction of flavour from a specific, high-quality product, than on the complex marriage of flavours and culinary techniques. Fortunately we don´t lack fresh fish, seafood, good wine or cheese. The Portuguese coffee is excellent as well. Occasionally you can also find something very tasty in the realm of sugar and eggs. My last discovery is called arrufada (from the Portuguese arrufar for sulk, fuss, get angry). These are sweet buns usually sprinkled with sugar. But do not worry! The buns are not so fussy as their name suggests. I suppose this funny name comes from the little picky eaters. These sweet arrufadas are sometimes the only thing kids want to eat! In the past these sweet bread rolls were eaten mostly on festivals, fairs and were very popular during Easter. Today you can buy them in almost every bakery in Portugal. Arrufadas come from Coimbra, the city famous for its university - one of the oldest in Europe (est. 1288 A.D.). In the South of Portugal the buns are almost always sprinkled with sugar but in the Northern part of the country you can also find some coconut on the top. But most of Portuguese people will call the latter version pão de deus (divine bread). 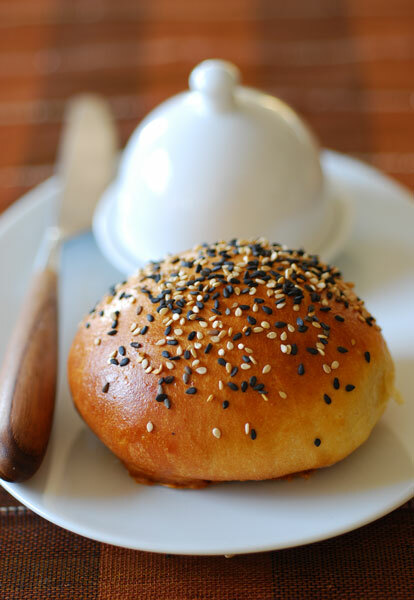 To avoid excessive sweetness I sprinkled my bread rolls with black and white sesame seeds. Sift all the dry ingredients. Put in a bowl and make a well in the middle. Pour all the wet ingredients into it. Mix in the bowl and then knead on the counter until you have a smooth and elastic dough. You may do all of this in a bread machine on "Dough" cycle. Cover the dough and leave it to rise in a warm place until it has doubled in volume. Turn the dough out onto a lightly floured surface. Slightly flatten it with the palms of your hands, form a long roll, and divide it into 12 equal portions. Form each piece into a roll (here I found an excellent tutorial). Put the rolls seam side down on the baking paper and leave to rise to double in volume again (it takes about 40 min). In the meantime, preheat the oven to 180ºC. 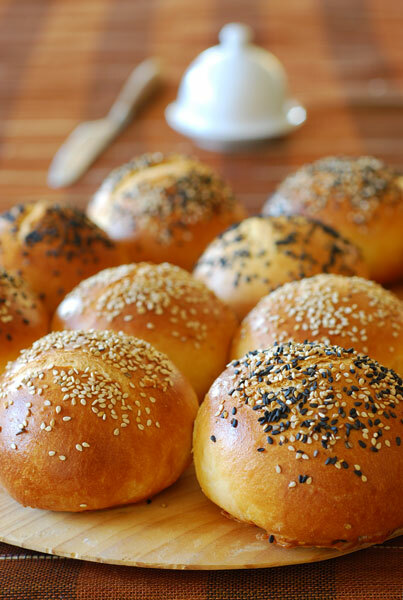 Brush the rolls with a mixture of egg and cream and sprinkle with sesame seeds or sugar. Bake until they are golden brown for about 25-30 min. What a beautiful, beautiful bread. I've never tried Portuguese pastries or bread. However, based on your description, they sound similar to Mexican breads, which I have a love/hate relationship with. I may have to try out this recipe. I doubt my rolls will come out as lovely as yours. That looks really yumm! I'm just wondering what type of flour did you use ?? All-purpose or bread flour? thanks! Memória, I remember some excellent bread rolls from my trip to Mexico. I believe they were called "conchas" (with a kind of sweet crust or streusel on top). I hope you'll enjoy my arrufadas. Please let me know how did it go. Anonymous, it is not so easy as it seems to answer your question. I live in Portugal and here in Europe we don't have all-purpose and bread flour. Actually almost every country has its own classification of flour types. I made these rolls with wheat flour type 65. This one has gluten content approximately 11-12g/100g. I am not sure what is the exact gluten content in all-purpose and bread flour in the U.S., but I think it will be safer to use a high-gluten flour in this kind of bread. Generally all European flours are weaker that American. Mark from The Back Home Bakery (you linked to his rolls video) has a excellent recipe for Portuguese Sweet Rolls. This one looks good too! Do you think the sweetened condensed milk made a big difference in texture and taste? These look really beautiful and really delicious. I'm trying to be more friendly with bread making, and this recipe sounds like something I'd like to try. Thanks for sharing it! I'm coming to Portugal. Yeeeeeaaaahhhh! I can't wait to eat there. These look so beautiful. I love bread like this to use as a fork with salads. You know, instead of the fork. My mother says I'm a heathen for eating this way, but there is nothing better! Hi, I didn't know how to contact you so I left a comment here. I like to invite you to http://www.tasteandshare.com, a food & wine social network, where you can share photos, videos and a link to your own blog. Toxobread, I have to try Mark's recipe. Actually I'm not sure what was the origin of American "Portuguese Sweet Rolls" or "Portuguese Sweet Bread". I suppose it might be a Portuguese "pão de leite"(milk bread) or "massa sovada" from Portuguese Azores Islands (there are a lot of Azoreans in the States). Sweetened condensed milk doesn't make a big difference in texture but gives it a richer taste. Christina and Jacob, the recipe is quite simple. Let me know if you give it a try. Michael, you're in for a treat. :) Take care. Carsten, thank you for your invitation. These remind me a bit of the French brioche; they look so lovely and would be delicious in the morning with that excellent coffee you were mentioning!